JEFFERSON CITY, Mo. (AP) — The Republican wall that has stood in state capitols for much of the past decade now has a few holes in it. Democrats flipped control of seven gubernatorial offices, marking their greatest gains in several decades, and picked up hundreds of state legislative seats in Tuesday's first midterm elections of President Donald Trump's tenure. Yet those victories didn't quite reach the lofty goals of an anticipated blue wave, leaving both major parties with reason for hope on Wednesday as they look ahead to another pivotal battle in 2020. 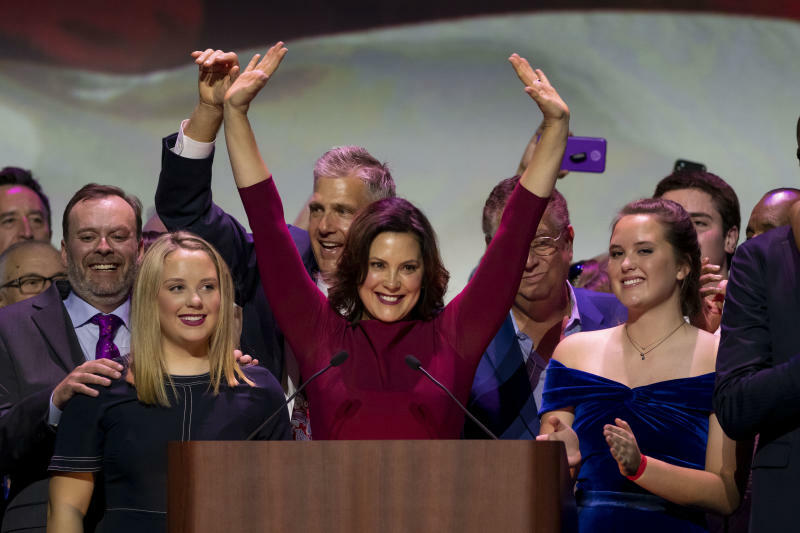 Some of the biggest wins for Democrats came in the Midwest, where Republicans had virtually wiped them out in prior elections. Democrats defeated Republican Govs. Scott Walker in Wisconsin and Bruce Rauner in Illinois while picking up open seats previously held by Republican governors in Michigan and Kansas. Democrats also flipped control of governors' offices being vacated by Republicans in Maine, Nevada and New Mexico. The Democratic Governors Association said it was their greatest number of pickups since 1982, the first midterm election of Republican President Ronald Reagan. The Democratic group's chairman, Washington Gov. Jay Inslee, called it "a broad-based win" and a historically big rejection of the president's party. 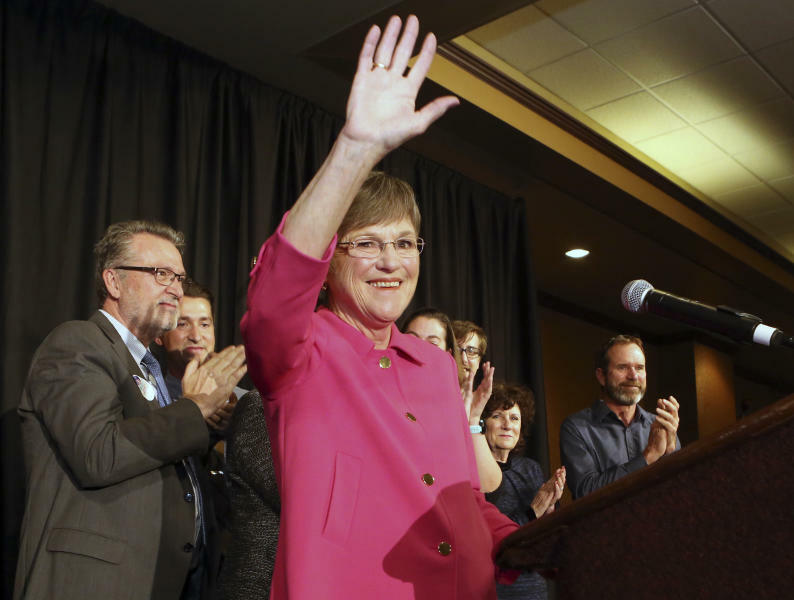 "For those who were troubled by the results of 2016 in the Midwest, we have proved that the Democrats can run and win," Inslee said. Yet Republicans held on to the governor's office in other key swing states targeted by Democrats, including Florida, Ohio and Iowa. Republican Secretary of State Brian Kemp also was leading in Georgia's gubernatorial race, though Democrat Stacey Abrams held out hope that absentee and the provisional ballots remaining to be counted could push Kemp's percentage below 50 percent and force a runoff. Republicans entered Tuesday's election controlling 33 governors' offices and two-thirds of the 99 state legislative chambers. 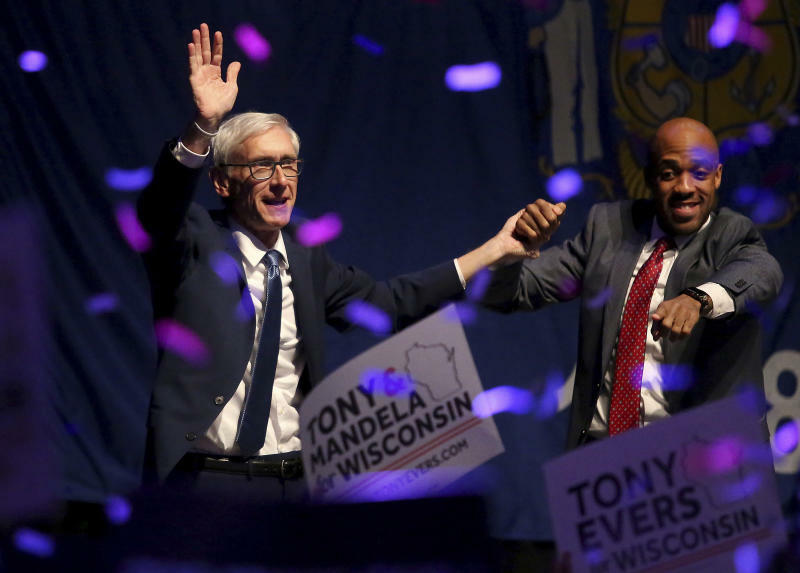 The Democratic gubernatorial victories will push that closer to an even split. But Republicans will still control at least three-fifths of the state legislative chambers, even after Democrats flipped about a half-dozen chambers. The gubernatorial and legislative gains appeared to give Democrats new trifectas of power in Colorado, Illinois, Maine, Nevada, New Mexico and New York. Democrats also broke up existing Republican trifectas in Kansas, Michigan, New Hampshire and Wisconsin. Democrats ended a Republican legislative supermajority in North Carolina, making it harder for the GOP to override vetoes by Democratic Gov. Roy Cooper. The Democratic gains amount to a mere "ripple" in Republican legislative control, said Matt Walter, president of the Republican State Leadership Committee. "It is not a wave, and I would say it's a far cry short of what they should have done" during a midterm election in which Republicans had to defend far more seats, Walter said. During the first midterm election of Democratic President Barack Obama's tenure in 2010, Republicans picked up about 725 state legislative seats while flipping control of 21 chambers. Republicans then used that enhanced power in many states to redraw legislative districts to their favor after the 2010 Census. Tuesday's shift of about a half-dozen chambers for Democrats is well below the average of 12 chamber changes per election cycle dating back 1900, according to the National Conference of State Legislatures. Whereas "Obama's first midterm was a wipeout for Democrats," the Republican losses Tuesday are "relatively modest," said NCSL elections analyst Tim Storey. That's partly because Democrats are still "running on mostly Republican-drawn maps," he said. Both Democrats and Republicans were trying to put themselves in a strong position for the elections in two years, which will determine which party will have the upper hand in redrawing congressional and state legislative districts after the 2020 Census. But that jostling for power will matter less in some states as a result of Tuesday's elections. Voters in Colorado, Michigan and Missouri approved ballot measures overhauling the redistricting process in ways that are intended to reduce the likelihood of partisan gerrymandering by either major party. The Colorado and Michigan measures set up independent commissions to handle the task instead of leaving it to lawmakers and the governor. The Missouri measure keeps in place an existing bipartisan commission for state legislative districts but creates a new position of nonpartisan state demographer to draft maps that prioritize "partisan fairness" and "competitiveness."